Ladies and Gentleman... in just a few short days (3 days and 2.5 hours to be more exact) I will have been a married woman for one full year. A WHOLE YEAR... can you believe it? I can't. Anyway, I've enjoyed moving in, decorating our home, and getting used to the overall crazyness that our married life has been so far. One of the things I found for our home was this awesome vinyl. It's visible as you walk into our home and is above our entryway hall closet. 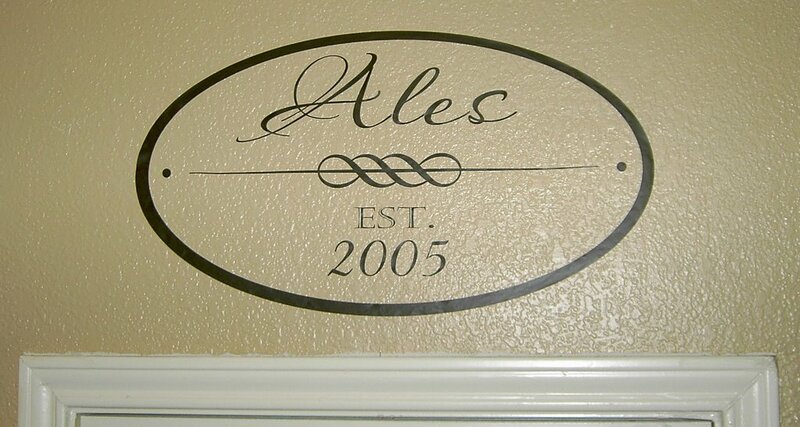 I had it custom designed and cut by a local company, Home Script (www.homescript.net). I love it! 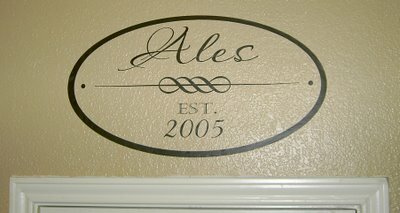 I have a few other pieces that I had done for other parts of our home - and I have a list going for future ideas. Using vinyl in home decor is awesome. It can be applied to almost any surface, and is easily removed. Once it's been applied you can't remove it and stick it up again (it's not reusable) but it's inexpensive enough that I don't mind. I plan on putting holiday appropriate quotes and sayings on the mirrors in our home for various occasions. I'll share photos when I get them up. So, if you're local (heck even if you aren't) and you're looking for something customized and creative for your home, check them out. I found their prices to be less than larger websites, and the attention to detail was impeccible. Plus you would be ordering from a locally owned and operated company - which is something I believe in whole heartedly. It sort of a take off on our wooden "Beste" sign, but I think I like it better. Unfortunately, we move around so much, I'd have to have a mega-ton of them made up to do the job. Who knows when we finally "park" our wandering feet for the last time, I may indulge. So - keep their website handy for me, will ya? Homescript did a board for us like that last year and we love it. Makes a great anniversary gift, too! what a great idea...the ideas are already spinning in my head!